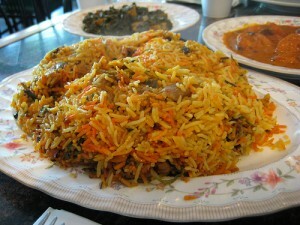 Basic Sindhi Biryani recipe by Shazia at DesiRecipes.com. Chicken /beef or lamb pieces, can be boneless or with bone or both. Wash then soak rice in water for 1 hour. In large pot, put meat, stock, 2 bunches of garlic , red chillies, coriander and fennel seeds, whole garam masala, onion chopped chunky, cover with water by a couple of inches. add salt about 1 1/2 tspoon. cook until meat is 95%cooked. Remove meat from pot and siv out ingredients, keep the remaining sauce or yakhni and set aside. In a blender put green chillies, garlic and ginger , blend. Chop tomatoes, slice 1 medium/large onion finely. In a large pot, add ghee or oil and heat, add sliced onions, fry until golden, add chopped coriander leaves and mint leaves about 1/2 cup each, and stir add the blended garlic /chillie mixture and continue to fry, add meat and fry for 5 mins, add chopped tomatoes and add drained rice and pour the yakhni sauce over the rice, cover by 2 cm, place on high flame until boil is achieved, then put on lowest flame and keep covered for about 20 mins. Check to see if rice is soft and seperated but don't check too often because the rice cooks in the steam. If more yakhni is needed, gently sprinkle a few drops on top and continue to cook on low flame. when ready serve with salad, raita, chutney and maybe shammi kebabs. why we use shan masalah???? shan or lazziza masala??????? ?why should we use tham?? The quantity of rice is not correct. Before posting recipes should be carefully checked. Rice quantity is way too much. 56 cups would feed over 100 people.